When I trained for my first marathon way back before the internets, I tracked my mileage on a Matt Groening Life In Hell wall calendar (oh, the irony). When I ran 5 miles, I scribbled a big "5" in the date's rectangle, tallied the mileage and circled the number at the end of the week. I loved seeing the miles pile up on the calendar--tangible evidence of hard work. I was onto something: Today 82 percent of runners like to track all their running statistics, according to the 2017 National Running Survey put out by Running USA, and 65 percent say it helps them run better. 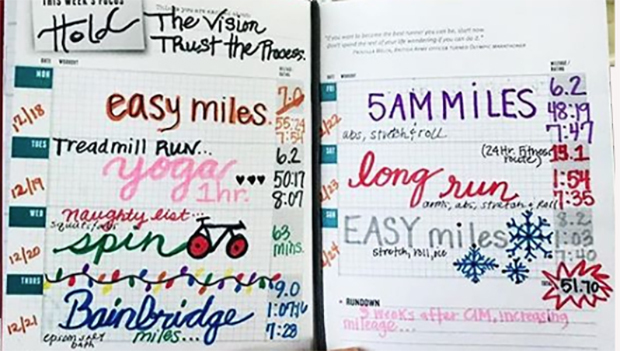 Tracking your mileage, whether online or on paper, is a rewarding motivator for consistency, the key ingredient of running success. Plus, seeing your goals in writing makes you more likely to achieve them. (I went on to run 53 marathons. Matt Groening? He just created The Simpsons.) Here's why you need to keep a training log and how to use the intel you record to race your best this year. You'll only stick with what you like. Do this right now: Decide how you're going to track your miles. An app? Active's Training log? Lauren Fleshman's sweet red-leather Believe Training Journal? A notebook? (You don't have to choose just one: Jeff Dengate, gear editor at Men's Journal, logs his workouts in three places.) The only thing that matters is using something that doesn't feel like a chore. If your tool of choice cues you to take notes on your workout and provides a rewarding hit of post-workout pride, you're on your way to creating a positive habit circle, according to Charles Duhigg, a runner and the author of The Power of Habit. But wait a minute, you say, my app collects all that data for me. Just make sure you take time to actively analyze the details. Log miles, times, weather and other details relevant to YOU. Noting anything you feel will help track behaviors to reinforce progress. In addition to distance, time, weather and routes, you might write down how much you slept, your waking heart rate (or general fatigue level), which shoes you ran in and what you ate before or after your run. Health matters too: Do you have a cold, an achy right hamstring, your period or a migraine? All of these will offer short-term insights and long-term patterns.